Author Tristan Donovan discusses his new book about the enduring popularity of the old-fashioned board game platform. Before the digital era, countless generations of kids grew up on board games, and plenty of us kept enjoying them as adults. That may have changed somewhat in the internet age, with mobile games, VR and 3D graphics that are almost lifelike. But the classics, with their dice and cards and face-to-face competition, remain unflaggingly popular. 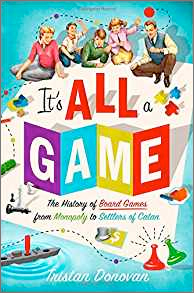 Author Tristan Donovan has delved into the history of these pastimes in his new book It’s All a Game: The History of Board Games from Monopoly to Settlers of Catan. He joined the Knowledge@Wharton Show on Sirius XM channel 111 to talk about the earliest known board games (you wouldn’t recognize what chess evolved from), what makes the most popular new games so appealing, and the real origin stories behind some of your old favorites. An edited version of the interview transcript follows. Knowledge@Wharton: Did your love of board games start when you were young? Tristan Donovan: Yes, absolutely. Our family played board games every Sunday. It was really a big thing. We’d have dinner, and then we’ll sit down and play games like Monopoly or the Game of Life. So it was very much a part of my childhood. Knowledge@Wharton: What’s the status of board games today? Donovan: They’re having a big revival. At the moment, there is a new wave of games coming through like Settlers of Catan, Ticket to Ride and Pandemic. These have really grown out of a slightly different design philosophy for board games that originated in Germany. But it’s led to much bigger sales of board games. Board game cafes are opening in cities all across the world. It’s really bringing in that new generation to board games after a few years where it looked like they were going to be cast aside in favor of video games. Knowledge@Wharton: The internet has obviously had such an important role in our society. So there has been an impact, but to a degree, it has been taken away a bit? Donovan: Yes. And the internet has also helped board games. The new games that are becoming really popular, word first spread about them through the Internet. People weren’t aware of the games that were being made in Germany, like Catan. It was the internet that helped spread word of them to North America and the rest of Europe. And then also on Kickstarter now — there’s more funding for board games on Kickstarter than there is video games. So it’s actually been quite helpful in reviving interest in board games by letting people know about what’s new, and also providing new funding streams for them. Knowledge@Wharton: This genre of entertainment has such a long and storied history. We’re talking hundreds of years of board games impacting people’s lives. Donovan: Thousands of years. We were playing board games before we had the written word. We don’t even know when the first board game was or when it began, it’s so old. And we have things like chess, which goes back hundreds of years; backgammon, which also goes back hundreds of years. Board games have very much been a part of human culture since the days of ancient Egypt at the very latest. Knowledge@Wharton: When you think about the marketing of games in the modern era – say, starting from Monopoly’s time in the 1930s — the marketing ideas behind them were that they bring the family together to have a shared experience. Obviously, that was something that companies with Monopoly and the Game of Life were very successful in doing for many years, and they still are today. Donovan: And the new wave of games hasn’t cast aside any of the old favorites. They’re still selling very well. I think board games do have that social side, that face-to-face, bringing-people-together aspect that is fairly unique. Video games are their obvious rival. They connect people online, but you don’t get the body language, you don’t get the eye contact, you lose a lot of the communication. There’s something about board games bringing us together around one table, everyone focused on that task, not distracted by what’s happening on social media or on their phone. Everyone’s focused on that game, playing together, seeing the whites of each other’s eyes. Knowledge@Wharton: You talk about a wide range of games in this book, and obviously when people think games, they think about Monopoly, the Game of Life, etcetera. But you also address chess and backgammon and some of those earlier games. Donovan: Yes. Backgammon is an interesting one. It’s had phases of huge popularity. It’s still very popular in the Middle East, and always has been, but it’s had stages where it was really popular in North America too. In the 1930s, it had this boom when it got attached to gambling. Then it went out of favor, and people joked about it as the spinach of in-game sports because there was so little interest. Then came the 1970s when it became cool again, and Mick Jagger and Tina Turner and all these big, glamorous stars were going to Las Vegas to play backgammon for big money. And of course today, it’s back to where it was — this forgotten game on the back of the checkers board. Knowledge@Wharton: Is Monopoly the most successful game of all time? Donovan: Certainly it’s the most successful branded game of all time. Probably chess or Go would be the most popular ever. But in terms of branded, commercial games where we can measure the sales, definitely Monopoly. Knowledge@Wharton: It is interesting how that brand has been able to expand. These days, we see “Star Wars” versions of Monopoly, baseball versions. Most major cities have their own ‘Opoly’ these days. The branding part of it has just exploded. And maybe that’s just the modern-day thinking of marketers, to a degree. Donovan: Yes. I think Hasbro, which owns most of the big, family games, has gotten very good at doing that, and not just with Monopoly. It’s done it with Risk. You’ve got “Star Wars” Risk. You’ve got a Simpsons version of the Game of Life. Essentially, Hasbro has gotten very good at merchandising games and cross-fertilizing them with other brands to retain interest. I think Monopoly led the way. And obviously, having the streets around the board made it very easy to make a local version of Monopoly. All you’re really changing is the paper on top of the cardboard. Knowledge@Wharton: Monopoly does have a dubious past in terms of its development. Who actually developed it? Who claims that they developed it? What’s the story behind whether or not it truly originated in Atlantic City? Donovan: Monopoly was really the last folk game. Board games tended to be like folk music. They would be created by people, and passed down from generation to generation, changing all the time. And Monopoly was really the last of those. The actual origin for the game, which was called Landlord’s Game, is that it was invented in 1902 by a woman named Elizabeth Magie. And it was a protest game. It was basically against people profiting just from owning land. It was there to show the injustice in the fact that if someone owned all the property, everyone else would end up destitute. So it was actually a criticism of property ownership, and people being allowed to profit just from renting out their land. The game wasn’t very popular, but it spread around academia. People would see it and make a copy. They’d change it a bit. The street names changed. Community Chest cards got added along the way. And eventually, it ended up in the hands of a man called Charles Darrow, who turned it into Monopoly and made it the commercial game that we know now. Knowledge@Wharton: Game of Life is another one that you talk about which has a long history. I didn’t realize that that has a history back to England as well. Donovan: That originated with a game called the Mansion of Happiness. The simplest way to describe it is as a very puritanical version of Candyland. And Milton Bradley played this in New England off an imported version. And this inspired him to make a similar game called the Checkered Game of Life. And again, it was very religious in its tone, which of course is very different from the Game of Life we know now, which was actually created in 1960 to mark 100 years since Milton Bradley made his first game. And of course, that game continues adjusting to the times. The 1960 edition had things like, you could find a uranium mine, and you’ll be celebrating getting a windfall from that — because at that time there were many incentives to go find uranium mines. Knowledge@Wharton: Scrabble is another game that has developed over the last 70 to 80 years or so. Donovan: Again, this is a game that was first conceived in the Great Depression, although it really found its success after the war in 1950s. It was derived partly from crossword puzzles. But I think what I found most interesting about Scrabble was the professional players, really, and how they look at it. You’d assume if someone is a Scrabble champion, they know lots of words and understand language very well. But actually the opposite is true. It’s all about math for them. They recognize letters as combinations of numbers, and they learn words just by their score. So the meaning of a particular word will be the amount of points it has on the board, rather than the player having any idea what the actual word means in some cases. Knowledge@Wharton: In many cases, the byproduct of these games is the thought process that it takes to play them, and the mental development people actually get from them. Donovan: Yes. With games, a lot of it is about thinking ahead. It’s about planning. Probability is obviously a very important thing in games where chance is an element. In backgammon, yes, there’s a skill element, but it’s equally a game of probability — working out what the probability is that my next dice role will allow me to do something versus my opponents. And of course, when you’re playing backgammon for gambling, that becomes very important. Knowledge@Wharton: Chess, to a degree, and backgammon have developed their own elements of gambling along the way. I’m thinking of Washington Square Park in New York City, where betting on your skill as a chess player is legendary. Donovan: Absolutely. There are lots of people who go to the chess plaza there, and there’ll be players offering passersby the chance to play them at chess. And some of them are making money out of it. The person I played against made a good $20 out of me. And I think I was quite an easy catch. But you know, that’s always been the case. Ironically, chess actually began as a gambling game when it originated in India during the early part of A.D. It was a four-player dice game where people gambled. It’s so far removed from chess as we know it today, but that’s what it evolved from. Knowledge@Wharton: It is one of those games that, because it’s not branded, still has an unbelievable life. Donovan: I think chess is here to stay. It’s one of those games that has just survived centuries and centuries. I mean, these rules are fixed now. It went through many centuries of revisions, but I can’t imagine that chess is going to change much in 100 years’ time from what it is today. But I think because of its pure skill, it’s easy to pick up, it’s easy to play, it’s quite mentally challenging, and it’s quite satisfying to win. There’s so much room for improvement and to develop skill, I think it’s always going to hang on. Knowledge@Wharton: Are companies like Hasbro and Parker Brothers truly still in the phase of developing new games on an annual basis? Or are they primarily focusing on the core games that they have and looking for offshoots from them? Donovan: Parker Brothers is part of Hasbro now. Hasbro pretty much owns most of the iconic family games that were big like Monopoly and Game of Life, and Battleship and the rest of them. I think it’s a mixture. They are looking to develop new games, but when you’re working on the scale of Hasbro, those games have to sell very large sums. A recent game they’ve come out with is Pie Face. It’s not really a board game. It’s a plastic action type of game. But it had to be a big hit. They recently did a Magic The Gathering board game. Again, it’s likely to be a big hit. But they can’t really be bothered to compete in the type of games where the question is, “Can we sell 50,000 copies of this?” Those are just too small for a company the size of Hasbro these days. So a lot of it is about extracting extra value out of the Game of Life or Monopoly and these strong established brands that they already have. Knowledge@Wharton: What do you think is the societal impact on our culture right now of this rebirth we’re seeing in board games, especially among the millennial generation? Donovan: I’m not a millennial, I’m Generation X, so who knows if I can get into the head space of a millennial. But I think there are two big lessons that the new board games are teaching. One is cooperation. Games like Pandemic are purely cooperative. There are no winners. It’s either everyone around the table wins or everyone loses. And even in a game like Settlers of Catan, where you do have one winner, everyone has to work with the other players somewhat as they are trying to win. So I think that board games are teaching the lesson that there is a need for people to work together; you can’t be the individualistic lone wolf and just tread on everyone else to succeed. Even winners are standing on the shoulders of others. So I think that’s one message they may be getting from games. Also, they’re providing some access to just normal face-to-face interaction without the distraction of smartphones or happening via screens. And I think that’s healthy. I don’t think necessarily you have to throw away your smartphone, but there are things we lose just by interacting virtually. Even a Skype conversation, for example, you can’t do eye contact and you lose communication within that. So I think it’s a positive thing that board games offer a chance for people to act socially together face to face. Knowledge@Wharton: But Settlers of Catan is not one that I had heard of in the past. Give us a little history on it. Donovan: It’s a game invented in Germany in about 1996. It spent about 10 years being very popular in Germany before it started to break through in the U.S. Essentially, you’re settlers on an island, and you get to claim land from which you collect resources like wood or brick. And using those resources, you build your little civilization. But you usually won’t have access to all the resources you need at any given time, so you need to trade for them with other players. It’s a trading, city-building game. It’s much more fun than I’ve probably described it. But now, this game has become very popular online. It became very fashionable among people in Silicon Valley. Companies like Facebook used to have Catan days, this was around 2010. It’s taken a long time for the game to start building up. I think the current sales figures are about $15 million annually worldwide. It’s one of the games that is becoming a new classic, if you like. It’s getting up to the level of Monopoly and Game of Life, where it will keep selling forever. But it has been a long time coming, so it’s not surprising you haven’t heard about it. It hasn’t had a big massive launch, just word of mouth over 20 years now. Knowledge@Wharton: How common is that type of timeframe in the development and marketing of a new game these days? Donovan: I think the games get developed fairly quickly, because they are still largely made by one person working on their own, or maybe two people working together. So the game development in itself can be very quick, maybe a year. But games that actually become big hits from the ground up without being connected to an established brand already are fairly rare. In the last 20 years, there have possibly been four games that could be classed as big hits: Catan, Pandemic, Ticket to Ride and Carcassonne. They’re games that have probably sold over a million copies worldwide now. And if you think, well, that’s it? In 25 years, four million, four games that have sold in excess of a million copies, that’s not very many. New super-hit board games are quite rare, but because there’s often only one individual designer for each of game, a game can sell a relatively small amount and still be worthwhile for that individual.